OPCs, Dr. Masquelier’s Mark on Health briskly tells you how and why Dr. Jack Masquelier’s discoveries and inventions are of essential importance to human health. In OPCs, Dr. Masquelier’s Mark on Health investigative researcher Bert Schwitters explores and explaines the limitless revelance of the products of Dr. Masquelier’s scientific work in today’s life. • Are you a boomer confronted with the first cracks of aging? • Do you suffer from arthritis or from cardiovascular problems? • Are you health conscious, yet not always capable of following ideal nutritional rules? • Are you an active sportsperson? • Is your condition impeccable? • Are you a health professional? OPCs, Dr. Masquelier’s Mark on Health briskly tells you how and why Dr. Jack Masquelier’s discoveries and inventions are of essential importance to human health. 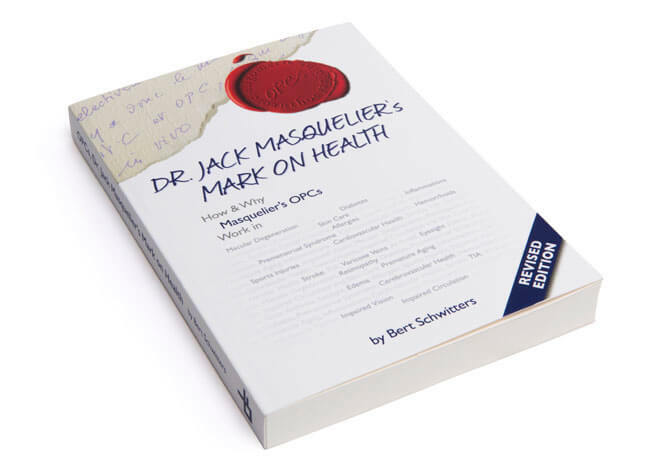 In OPCs, Jack Masquelier’s Mark on Health investigative researcher Bert Schwitters explores and explains the limitless relevance of the products of Dr. Masquelier’s scientific work in today’s life. the body’s tissues, systems and functions. Against the backdrops of ever changing definitions and terminology, Masquelier meticulously and uncompromisingly carved OPCs’ phyto-chemical profile. OPCs, Jack Masquelier’s Mark on Health vividly explains what OPCs are, why they differ from “grape seed extracts,” why they differ from “bioflavonoids.” OPCs are a high performance phyto-nutrient. They work beneficially in cardioand cerebrovascular health, diabetes, rheumatoid arthritis, impaired vision, macular degeneration, varicose veins, hemorrhoids, impaired circulation, skin care, sports injuries, edema and premature aging. Last but not least, they beneficially stimulate cardiovascular health by influencing gene expression. OPCs are effective in seemingly unrelated conditions because they protect collagen, stimulate circulation, catch free radicals and boost vitamin C. In fact, OPCs are the actual vitamin P.
has seen since the end of World War II, OPCs have steadily gained in relevance and potential.